An AI-powered search tool is being used to monitor fake news and polling station problems in Mexico's elections. Krzana is being used by the Verificado 2018 initiative which was set up by Mexican media to challenge fake news. The run-up to Mexico's election has been deadly with more than 130 people killed since campaigning began. Fearing more violence, Verificado plans to use the tool to react quickly to propaganda on social media and violence aimed at voters. Verificado has been set up by more than 90 separate organisations including publishers, media groups, NGOs and universities and has enrolled social media giants Facebook and Google to help monitor the election. The sharply contested election has been marked by widespread use of bots and trolls to spread fake stories on social media. Krzana will be used during the weekend of voting, said Toby Abel, Krzana co-founder, to help media groups pick out and react quickly to bogus information. The tool has been taught to scan and analyse text, video and stills on social media to spot items and messages that relate to candidates and the election. It can do this faster and more comprehensively than a human could, said Mr Abel, but the machine will not be left to decide on whether what it captures is fake or not. "Working out if something is false or not is something that a good journalist can do very quickly," said Mr Abel. "It's unbelievably difficult to teach a computer to do the same thing." Once the bogus stories have been spotted, media groups plan to write messages that debunk claims or show who has put them together. Reaction speed was vital when countering fake news, said Quin Murray, Krzana's other founder. "It's about getting in there before the original has had chance to spread," he said, adding that the key was tapping into the same lines of communication that help speed stories people want to read across social networks. "That speed is so important because if someone reads a fake story and logs off that could be the closing thought that they are left with," he said. Krzana will also look for information about polling stations on the day of voting as many could become targets for actors looking to influence the election by dissuading voters from turning up. "There's quite a large fear that there's going to be fake information thrown around about attacks and gunfire at polling stations where one party thinks they are going to get more votes," said Mr Murray. Media groups had people ready to travel to stations to verify claims of violence or report if they were trouble-free. Mexico's general election takes place on 1 July and will see the country elect a new government and president. Long-time activist Andres Manuel Lopez Obrador is the front runner and is expected to win the presidential contest. 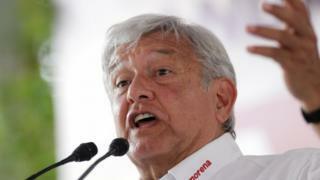 Video Mexico election: Who is Andres Manuel Lopez Obrador or 'Amlo'?